Family – Who were they? Arthur Linfoot does not seem to have felt that he was writing for posterity, and he never explains about his relatives, so we can’t always be certain who his various uncles and aunts were – there are two Uncle Jacks, for a start. Very little is known about Arthur Linfoot’s mother’s side of the family. Even on the better-documented Linfoot side, we don’t know what relation to him Lily Linfoot was, and Willie Marshall, whom she married, may also have been a cousin at some remove. Below is a partial family tree showing Arthur Linfoot’s paternal grandparents, his parents, aunts and uncles on his father’s side, siblings, their spouses and children. Click or tap it to see a larger view. Offspring not yet born at the time of the diaries are omitted, spouses of Arthur Linfoot’s siblings are only shown where marriages were current at the time of the diaries and spouses of aunts and uncles and their offspring are also omitted for simplicity. Brief biographical details of some of the close family are set out below. Charles Linfoot, born 1830, was Arthur Linfoot’s grandfather. He was brought up on the Family’s farm at Spofforth in North Yorkshire, left home as a railway navvy, and having married in Sunderland, and wishing or having to stay there, became a coal trimmer in the coal-exporting vessels which filled up at the staithes on the Wear. Charles Linfoot died in 1891. At the start of the diaries in 1914, Elizabeth was living in Christopher Street, Sunderland, with a married daughter, Esther, her husband, John Wilkinson (not shown above), and their grown-up son, John Lindsay Wilkinson (also not shown above). This extended family group is referred to in Arthur Linfoot’s very first diary entry of 1914 as “the Christopher Street people”. Christopher William Linfoot, born 1855, was Arthur Linfoot’s father who had, prior to the beginning of the diaries, been employed as a mouldings machine operator at Robson’s Saw Mill at the docks in Sunderland. He had recently had an accident with a mouldings machine which resulted in the loss of two of his fingers and the diary contains a record of his successful claim for compensation. Arthur Linfoot only ever referred to his father as “father”; diary entries which mention him are tagged “father“. Very little is currently known about Arthur Linfoot’s mother (Dorothy, née Wilkinson), except that her brother John Lindsay Wilkinson married Arthur’s paternal aunt Esther Poulter Linfoot. Arthur Linfoot only ever referred to his mother as “mother”; diary entries which mention her are tagged “mother“. Edward Beauman Linfoot, one of Christopher Willliam Linfoot’s brothers born in 1857 and known to Arthur Linfoot and his siblings as “Uncle Ned”, is recorded as having died suddenly while the family was on holiday in Bowes on 8th July 1914. As appears to have been common practice within the family around this time, he was given the middle name Beauman after his mother’s maiden name. Nothing else is known about Edward Beauman Linfoot. 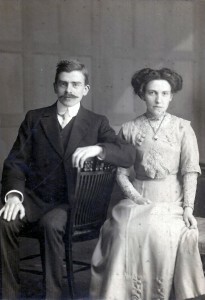 Mary Elizabeth Wiseman (née Linfoot), known to the family as “Marmie”, was Arthur Linfoot’s elder sister and was married on 6 June 1911 to Joseph Wiseman, who was evidently also very friendly with Arthur Linfoot and known to him as “Joe”. Presentation Bibles from the South Durham Street church record that Joe had gone to work in Lincoln in 1905, where Marmie joined him on marriage, but they appear to have been back in Sunderland by 1914. Diary entries which mention Marmie are tagged “Marmie“, and diary entries which mention Joe are tagged “Joe“. By the time of the diaries, Marmie and Joe had a daughter, Dorothy, whose birthday is periodically noted in Arthur Linfoot’s diary. Diary entries which mention Dorothy are tagged “Dorothy“. In June 1915 Joe started work at Doxford’s, a ship building company in Sunderland where he worked for the rest of his life. Doxford’s, along with other ship builders in North East England, was a significant supplier of vessels to the Admiralty during the war. Ernest William Linfoot, known to the family as “Ernie”, was Arthur Linfoot’s elder brother. He was married to Hilda (née Tulip). Diary entries which mention Ernie are tagged “Ernie” and diary entries which mention Hilda are tagged “Hilda“. Ernie was originally apprenticed to a dispensing chemist, but then worked for a bookseller in Waterford. By the beginning of the diaries, Ernie and Hilda were living in St Andrews, on the east coast of Fife in Scotland, where Ernie was again working in a book shop. 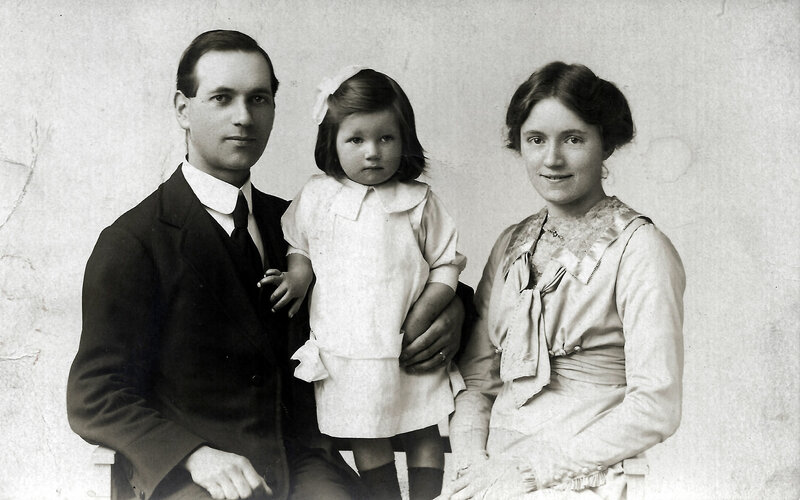 The birth of their daughter, Moira, is recorded on 5th August 1914, the day after Britain had entered the war. Arthur Linfoot spent his holidays in St Andrews with Ernie, Hilda and Moira in June-July 1915. Ernie and Hilda left St Andrews to return to Sunderland in January 1916 and Ernie later volunteered to serve with the Royal Garrison Artillery, being awarded a Military Medal on the Western Front. He returned to his job at Hill’s book shop in Sunderland after the war, until his retirement in the 1950s as managing director. As a widower in the 1970s, he lived in Oxfordshire with Moira and his younger daughter Sheila (who in her teens was a nurse in the London blitz). Charles Collingwood Linfoot, known to the family as “Charlie”, was Arthur Linfoot’s younger brother. At the time of the diaries he was unmarried. Diary entries which mention Charlie are tagged “Charlie“. Charles Linfoot was embarked for the Dardanelles in October 1915, but was apparently spared from service there by the decision in late 1915 to abandon that campaign. 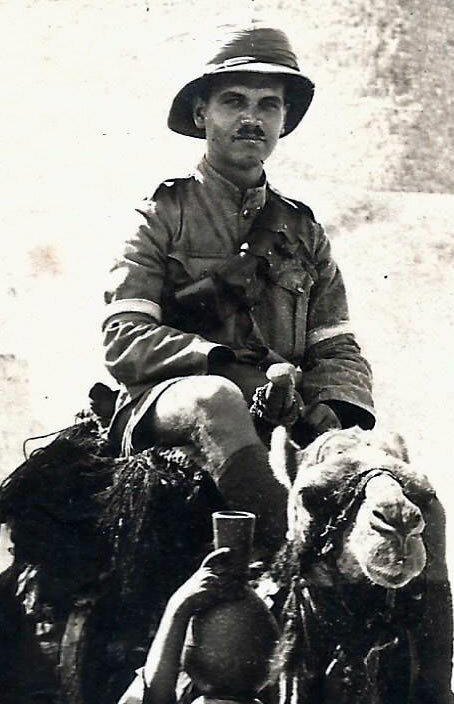 By early December 1915 he was in Alexandria, and then served until the end of the war in Egypt, Palestine and Thessalonika. 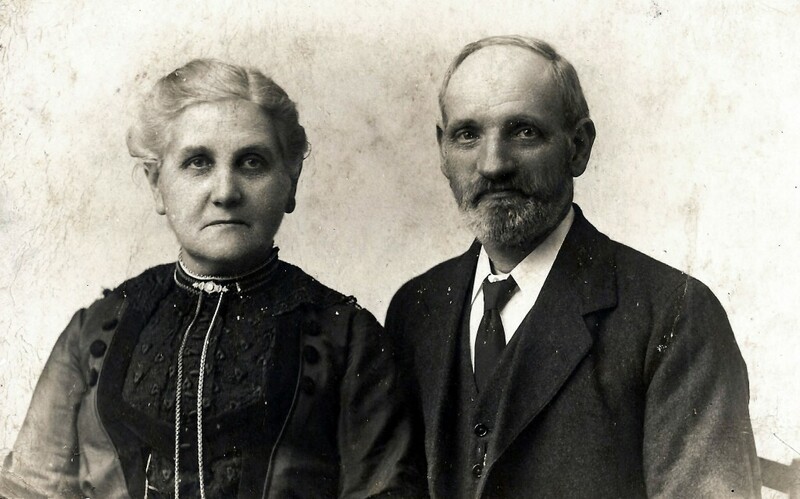 He married Mary (Whatcott) in 1923, had one son (John) in 1930 who survived only three months, and as a widower in 1972 married the widow of a former Post Office colleague. Gertrude Wilkinson Linfoot, known as Gertie, was the youngest of Arthur Linfoot’s four siblings. Diary entries which mention Gertie are tagged “Gertie“. Like most of the family, she had musical gifts, and was a good pianist. Unmarried at the time of the diaries, she later married William (Billy) Stevens, and they lived in the same street as Marmie and Charlie. Billy Stevens was a gardener by profession, employed originally by owners of large private gardens, but by Sunderland Corporation from the late 1930s; after WW2 he was park-keeper of the Mowbray Park, adjoining the town centre, and he and Gertie then moved to a ‘tied’ house at the Park. He was too old to be called up early in WW2, but he joined up in 1941 or ’42 and (having hurriedly learned to drive) served as an RASC lorry driver during the North African and Italian campaigns. While Billy was away, Gertie lived alone in their house during the air raids, worked in Hills’ bookshop with her brother Ernie, and later told how she played the piano for hours every night to keep loneliness at bay. William (Willie) Gaylard Whittaker (killed in France on 22 October 1917, name on the Tyne Cot Cemetery memorial at West-Vlaanderen in Belgium) shared his middle name with Arthur’s paternal uncle, William Gaylard Linfoot (emigrated to New Zealand, 1912), and may well have been Arthur’s second cousin. Diary entries which mention Willie Whittaker are tagged “Willie Whittaker“. Arthur Linfoot mentions the name Hilda some 43 times, referring certainly to three separate people, possibly to four. In most cases it is reasonably clear which Hilda he means, but not in all; and while we know who two of them were, the other one, or two, are still a mystery. This page summarises what we know. Diary entries which mention Hilda Linfoot (née Tulip) are tagged “Hilda“. Diary entries which mention Hilda Linfoot (New Zealand) are tagged “New Zealand“. Diary entries which mention Jack and Hilda are tagged “Jack and Hilda“. Have you put the Linfooy family tree onto the Ancestry app or website there is a chance that other distant relatives would turn up if you did. Not yet, but thank you for the suggestion. Hi can you please tell me the relationship to Charlie. also where can I find the family tree. Great diary really enjoying it. Charlie was Arthur Linfoot’s brother. The family tree is not on-line yet but I hope to publish it eventually. Thanks for this insight. What is your source for this information?